Bananas the dog is the constant companion of Poopydoop45, a new video blogger with his own “Let’s Play” channel on YouTube. Click here to watch. Although the concept — which involves playing a video game and posting some sort of corresponding walkthrough for others to view — is fairly old, it’s recently become an explosive YouTube trend. Whether they’re toiling in the fiery depths of “Diablo” or playing the hero in “Skyrim,” ordinary gamers are becoming Internet celebrities by recording themselves playing games, providing an audio commentary, and uploading it onto the popular video site. The trend has become so profuse, it’s getting a little hard to find good, quality videos that actually deliver what they should: a lighthearted walkthrough that not only entertains, but helps fellow gamers with tips and tricks. That’s why I was delighted to find a YouTube user by the name of “Poopydoop45.” If the handle alone wasn’t enough of a giveaway, when you watch this guy’s work, you’re getting pure fun. 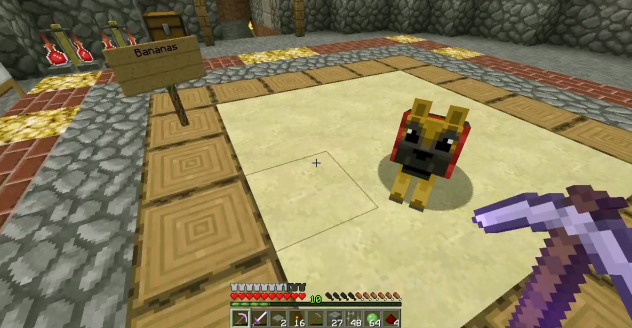 Poopydoop specializes in “Minecraft” videos, though he’s promised fans a venture into “Skyrim” territory sometime soon. With his canine companion Bananas at his side, Poopydoop offers his fans a pretty unique take on “Let’s Play” videos. Instead of just recording his adventures in the pixelated world, Poopydoop is very fan-focused. He communicates with his viewers and helps them accomplish in-game tasks by creating step-by-step tutorials. His commentary is always entertaining, whether he’s got your attention span in a chokehold while he navigates through the Nether, or cracking hilarious jokes without much effort, Poopydoop’s videos are truly captivating. But it’s his genuine kindness that is the best thing about his “Let’s Play” series. It’s obvious that Poopydoop is all about his fans. He is constantly asking his viewers what they want to see. Most of all, he is genuinely grateful for every view, subscribe, and “like” he receives. It’s refreshing to see such a down-to-earth attitude in this ego-centric world where any ol’ Joe thinks his rendition of a Lady Gaga song is YouTube gold. Even if you’re not a “Minecraft” player, I highly suggest checking out Poopydoop’s channel here, especially as he continues to explore other gaming venues. You might just find yourself a new gaming obsession — but you’ll definitely find yourself a great friend.